It has become one of Southeast Asia’s premier entertainment attractions drawing thousands of visitors from all over the world to come along to the best and biggest "transvestite" cabaret show to be found in Phuket each evening. A single show covers the entire range of musical theatre from cultures all around the world. 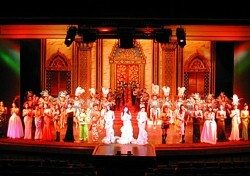 Mixtures of culture are Traditional Thai Dance, Japanese Dance Chinese Dance, song and a lot more Extravagant costumes, make-up and stage scenery then returning to take the audience from Egypt to Latin America to China and back to Thailand in themed productions of classical dance and song. We could say it is perhaps that Simon Cabaret is the largest "transvestite" (lady boys) cabaret to be found Thailand. This show features a terrific musical floor show performed by the world famous "lady boys" of Simon Cabaret. glitteringly colorful costumes, excellent sound system and luxurious stage sets are all part of this theatrical extravaganza.